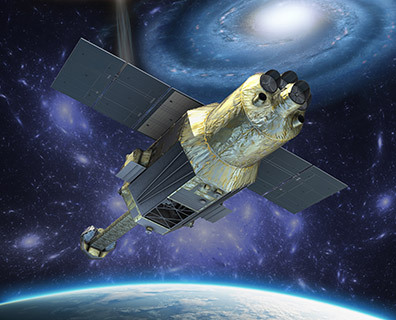 March 28, 2016 – The Japan Aerospace Exploration Agency (JAXA) reports that communication with the X-ray Astronomy Satellite “Hitomi” (ASTRO-H), launched on February 17, 2016 (JST), failed from the start of its operation originally scheduled at 16:40, Saturday March 26 (JST). Up to now, JAXA has not been able to figure out the state of health of the satellite. The cause of communication anomaly is under investigation, but JAXA said that it has received short signal from the satellite, and is working for recovery. Several websites, however, are reporting that Hitomi is tumbling through space. Under this circumstance, JAXA set up emergency headquarters, headed by the President, for recovery and investigation. The headquarters has been working for recovery and the investigation of the cause. Updates will be announced as available, at the JAXA website. The next generation X-ray observatory “Hitomi” (ASTRO-H) was developed from an international collaboration including Japan and NASA. The cutting edge instrument on board is the “X-ray micro-calorimeter,” which was to observe X-rays from space with the world’s greatest spectral capability. The other 3 detectors on board allow high sensitivity observations in a wide bandwidth spanning soft X-ray to the softest Gamma-ray. “Hitomi” (ASTRO-H) was expected to apply these new functions to investigate the mechanisms of how galaxy clusters—the largest objects in space made of “visible matter”—formed and influenced by dark energy and dark matter, to reveal the formation and evolution of supermassive black holes at the center of galaxies, and to unearth the physical laws governing extreme conditions in neutron stars and black holes.